Every wreath will be unique, reflecting the creativity of the person making it. Wreaths can be used as table centre pieces on Easter Sunday or secured on the doors of residents' rooms. Stiff cardboard for frame: cereal boxes are suitable. For Decorations: Hole Punch, beads, ribbons, lace, pearls, glitter. Download the template and trace wreath onto cardboard. Cut out inside circle to form the wreath. Ask participants to cut out the traced eggs. 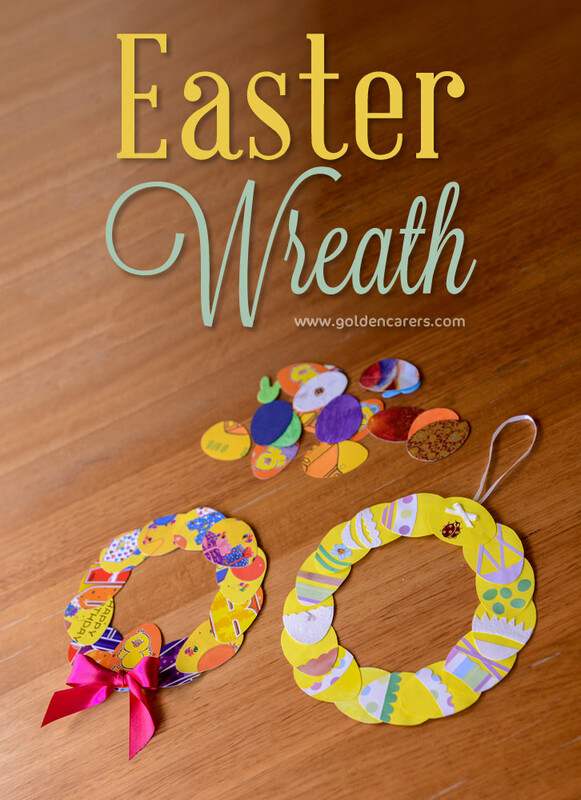 Participants should decorate eggs before assembling and gluing them into wreaths. Glue a cotton string onto the back of the wreath (you may skip this part if the wreaths are to be placed on doors or used as table decorations). Glue decorated eggs around wreath frame as you like. Tie a ribbon or glue a bow to the centre of each wreath. Lori -- if you want to color eggs with Dementia residents, try colored plastic eggs and let them put spring themed stickers on the eggs. When they are done, you can fill them with a little treat. You can try stickers with hard boiled eggs but depending on what level they are in their dementia, egg holding while decorating may be a challenge. Hi Lori, with dementia clients it would be better to cut off easter eggs from yellow construction paper. For decoration cut strips of colored paper and also cute pictures from magazines and old calendars. Dealing with glue is not as messy as paint. We've been doing this activity too. To ring the changes we leave the circle complete and use scrunched up tissue paper to decorate the centre. This is a great idea! And one that everyone can do! What a wonderful Idea. I am so glad I have joined your Golden Carers group. I had run out of Ideas.